Located on a cul-de-sac, this Fully FINISHED 2473 sq. 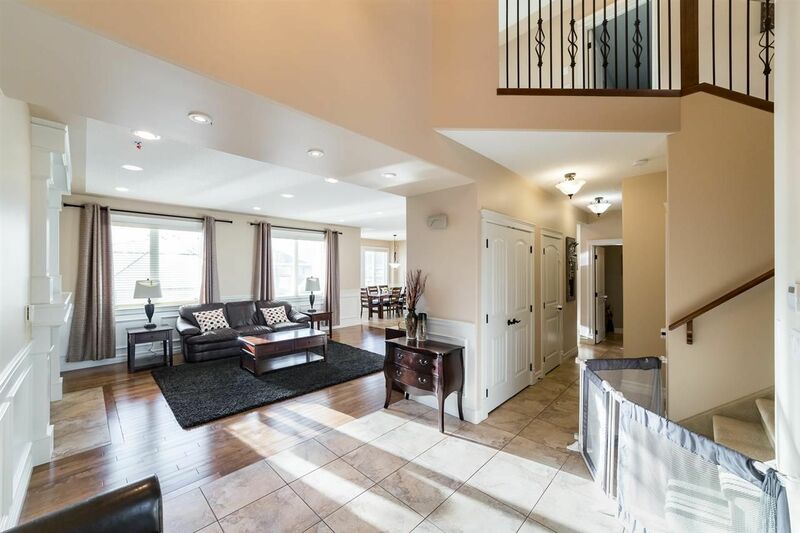 ft. with bonus room two storey with professionally finished basement is perfect for the whole family. On the main floor you are greeted by 18" porcelain tiles, gleaming hardwood floors, a spacious foyer with 18' cathedral like ceiling! Living Room with Gas fireplace and built-in entertainment center flows directly into the granite kitchen with lrg eating nook, breakfast bar, and toffee maple cabinetry. Banks of windows and a garden door give great access to the fully fenced & landscaped back yard and 19'X14' Dura deck deck. On the upper level you will find a huge bonus room, 2 add. spacious bedrooms, 4 pce bath and a luxurious master bedroom complete with 5 piece en-suite and walk-in closet. Additional bedroom downstairs and another 4 piece bathroom, 23'X25' o/s double attached garage, wrought iron accents throughout and a Very Spacious Backyard! !